Next to peaceful Walden Creek, we are perfect for fishing, wading or just relaxing! Only 4 miles from Dollywood & the best in dining, outlet mall shopping & great entertainment. Come stay with us & experience it all! This month was our 4th time staying at Creekside RV. We've enjoyed our stay each time. Very clean campground, the bathrooms and bath house were very clean. It's close to all of our favorite shows in Pigeon Forge and just a short drive to the Smoky Mountains, Downtown Gatlinburg and Cade's Cove. The trolley passes through the campground if you chose not to drive. Staff is very friendly and accommodating. Just an FYI: Don't follow iphone gps from I-40, it lead us off of the main highway and put us on some roads that weren't really suitable to pull campers on. The website specifically states this, I missed it because our gps in the past kept us on main roads. I thought the gps on my phone would take us the same route but it didn't. Amazing experience at Pigeon Forge. The sites are fairly level, gravel with concrete patios and shade trees. Our site had excellent CATV, WIFI, and 50 amp service. The Pigeon Forge trolley ran thru the campground making a car to get into town unnecessary. The campground is just a matter of minutes from the main attractions and shopping of Pigeon Forge. Campground personnel were helpful and very friendly. The pool area was nice with tables, chairs and umbrellas available to get out of the sun and relax poolside. A high school is beside the park and we could hear the band and the football team practicing in the afternoons. This was our first trip with our new Class A. It is a shorter one 27ft. so we fit just fine on a creekside spot. The creekside spots are level side to side, but do slope slightly towards the creek, not bad though. All other spots were very level, did not notice anyone having to use levelers. The concrete patio is a good size, with picnic table and a fire ring near the pad. The staff are very friendly and helpful. The store does not have any food or soft drinks. There is a good selection of RV accessories in case you break something or forget one. The laundry has nice machines that appear to be new, and work very well. The only thing that they could change would be to place the cable TV connection in the power box, it just comes up out of the ground next to the power hook-up, not protected from rain or dirt. We enjoyed our stay and will be back. 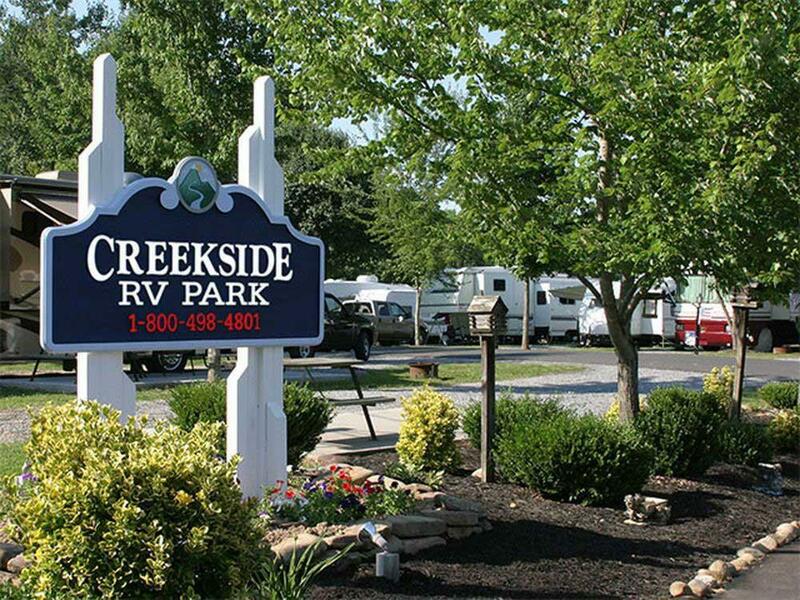 Creekside RV Resort is about a mile off the main drag in Pigeon Forge, so you’re close enough to everything, but have a bit of country around to relax. The park is not huge and situated on Walden Creek. Unfortunately (for us) the Creekside part is mainly set up for small 30amp campers. The larger rigs are put in the middle, or like us on the road perimeter. Our site backed up to the main road and was noisy. The spaces are fairly well sized, but on the short side, so with our 38’ TT backed up to the fence, we had to park out truck at an angle to get it off the road. Sites on that part of the property all seem to slant downhill back to front. We saw a Class C a couple doors down with 6” of legos under the front wheels! Staff at the park are super friendly. The nice lady at checkin gave me several local coupon books and maps and was happy to give directions to local attractions. A municipal trolley serving the tourist sites actually makes a loop thru the park every hour and for 50 cents you can catch a ride to Dollywood. The bathrooms and showers were fine. Water and power fine, but sewer outlet was in back of site which required 20’ of hose and runs uphill. Emptying tanks required much manual manipulation of the hoses to clear the stuff. Very nice quiet and well kept park. We stayed on a Creekside site. Owners were very helpful with getting our rig level and set up on site. This is a really nice campground. It has some shade and the bath house was clean. The staff is very friendly and helpful. Our lot was beside the creek and the lot had a concrete pad. We go to Pigeon Forge several times a year and we always camp at Creekside. They are on the trolley route and it makes getting around easy if you don't tow a vehicle. Staff very helpful and friendly. Very clean bathhouse as well as park. Stayed here because daughter was playing softball in World Series there and found it to be the perfect location. Not to far from anything but not in the hustle and bustle of everything. Sites could be little bigger but that the way all campgrounds up there are. Very friendly staff and good pricing as well. We will be back for sure. Everyone was very friendly and helpful. Even being just off the highway (so to speak) you are set in a peaceful family campground. We have strayed at Creekside at least twice a year for several years now and love it. The problem with this campground is it is getting to small for the todays big rigs. The sights are to tight that people are hitting trees and water lines trying to get their big rigs into the sights. The newer part doesn.t have this problem but the older part does. While I was there this time there was a water line broken off and a tree took out with a travel trailer. Also the rig behind me was so long it was backed up past the rear of my camper. If the sights wasn't staggered he would have been in my bedroom. They need to spend some money and redo the old part, take out some sights and make the rest bigger or they are going to loose a lot of business in the future. It is still a nice campground and I would recommend it if your rig is less than 32 feet long and the left slide will not take out the water line when slid out. If the slide slides out more than 3 feet you have bought yourseld a water line because it is 3 feet out of the ground and is located at the middle of the campsite. Also with the big rigs there is hardly no place to park your car, especially the ones on the creekside, except in the drive which is close with rigs comming is and leaving. The owners are really friendly and helpful and they are one reason we keep going back. We will probably keep going back unless we find one that is much bigger and better. Very pleasant stay. Everyone in the office were very helpful and friendly. Looking forward in going back! Good Sam Members Save Double - 20% off! Come to Pigeon Forge & be entertained! Stay with us for fun & relaxation, whether it be a swim in our beautiful saltwater pool or roasting marshmallows by a cozy campfire! We honor Good Sam members! From Jct US-441 & US-321: Go SW 1 mi on US-321 to Henderson Springs Rd, then NW 1/2 mi (R) (2nd campground on right) Note: Do not follow GPS.